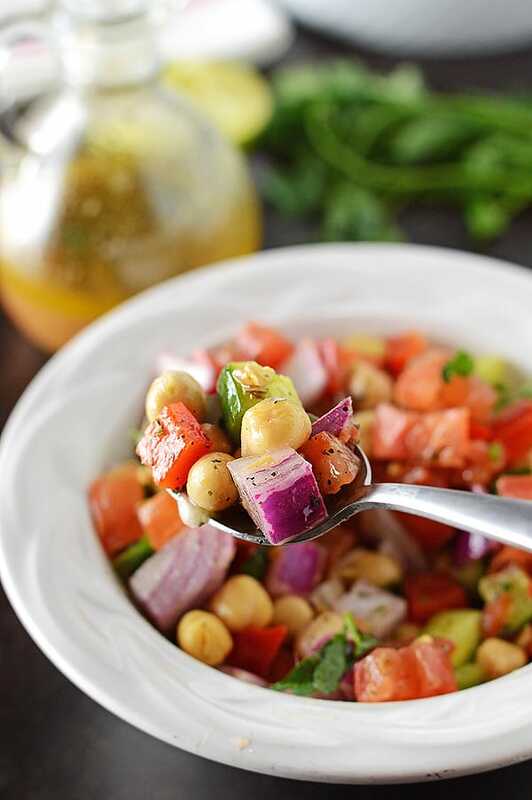 Delicious and filling Mediterranean chickpea salad spiced up with a bright dressing that is above your usual. Very healthy, very tasty and 100% vegan. 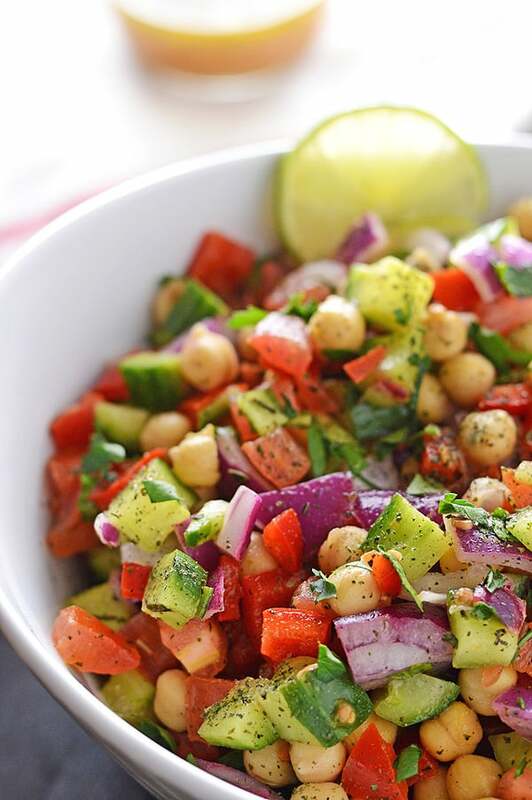 Red onion, tomatoes, cucumber, bell pepper and parsley are all combined with chickpeas and seasoned to perfection. All the favorite fresh vegetables in just one delicious bowl. Packed full with big flavors, this salad is a great make ahead for parties and gatherings. 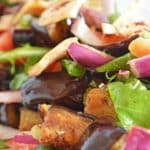 A colorful salad that will brighten any dinner table, with leftovers great for lunch. 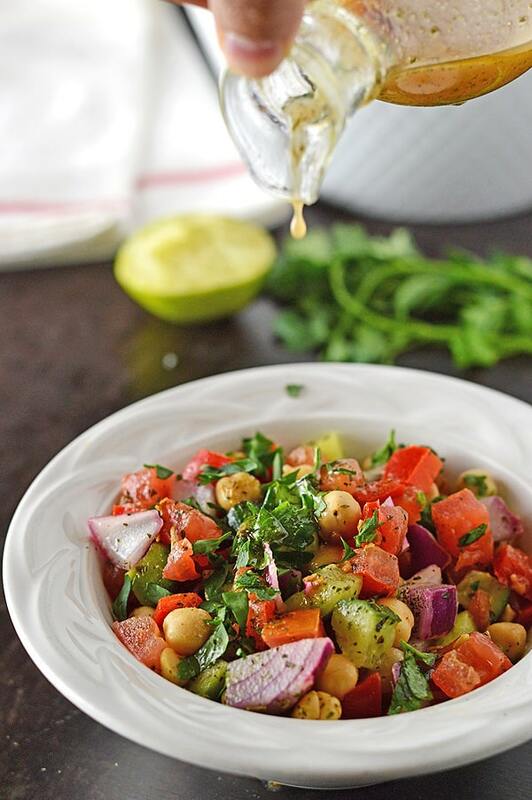 This Mediterranean chickpea salad is hearty and very filling with my favorite spice combination. The dressing for this salad is extremely mouthwatering, I though I could drink it on its own襤. I was not a fan of chickpeas when I was young, I guess most little kids are. So I was not surprised that my kids picked up the chickpeas from their plates but no worries I made sure I ate them all. Chickpeas are my favorite these days, they keep my appetite under control and provide a variety of vitamins and minerals, as well as a decent amount of fiber and protein. You do not have to wait until summer to celebrate colorful veggies, veggies need to be celebrated all year long.. right? This no cook, easy chickpea salad is considered a meal on its own. It is a constant reminder that we can actually eat veggies and be happy with it. Chickpeas are a staple in the Mediterranean pantry, and it is a very affordable meat substitute for vegans and vegetarian people. This little chubby legume is an excellent source of protein, healthy fats, fiber, carbohydrates, and a long list of vitamins and minerals. Being packed with protein and fibers, checkpeas is considered an good food to promote weight loss. My mom told me no, and I believe my mom end of the story. Researchers say that canned beans have almost the same nutrients as the dry one, may be a little bit less. But the problem is that canned beans have mush more sodium in them. Almost half of that sodium is washed away when we rinse the beans but take note that you are also washing away some of the nutrients. I always like cooking my own dry beans, but you know what? out of convenience I sometimes use canned chickpeas like in this recipe. How do you make chickpeas tender? Here is my mom’s method for cooking chickpeas. First you’ll need to cover with cold water and add about half a teaspoon of baking soda for each cup of dry chickpeas. Soak overnight or in hot boiled water if you are in a hurry. Drain, place in a pot and cover with cold water ( almost 1 litre/1cup of soaked chickpeas), bring to a boil then reduce heat and simmer until tender checking every now and then for the water level. Take about 75-90 minutes to cook. Cut the vegetables in cubes and place them in a deep bowl. You can add different colors of bell peppers if you would like to. Add your cooked or drained and washed canned chickpeas to the bowl. Add the parsley. Add all the dressing ingredients to a jar and shake to combine. At this point you can cover the bowl and refrigerate for up to 6-10 hours. When ready to consume, pour dressing over and mix everything together. you can serve immediately or better refrigerate for 30 minutes or so then serve. 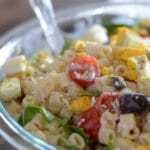 This Mediterranean Chickpea Salad is an easy, healthy, gluten-free and vegan rainbow in a plate. It can stay in the fridge for several days, just drain and use if you wish. Personally, I like having this veggie water with my salad . Works great as a side dish for your grilled meat or as a hearty filling lunch. You may consider adding one or more of these ingredients to play with the recipe more : feta cheese, tofu, tuna or black olives. 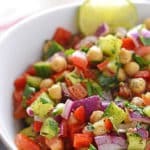 A pretty, colorful vegan Mediterranean chickpea salad for a quick filling lunch or as a side dish to your grilled meats. 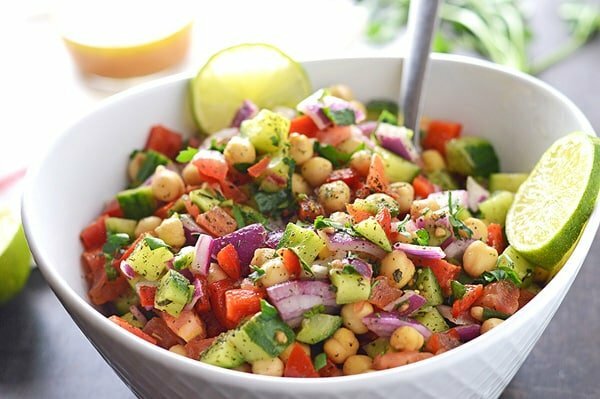 A pretty, colorful vegan Mediterranean chickpea salad for a filling lunch or as a side dish to your grilled meats. 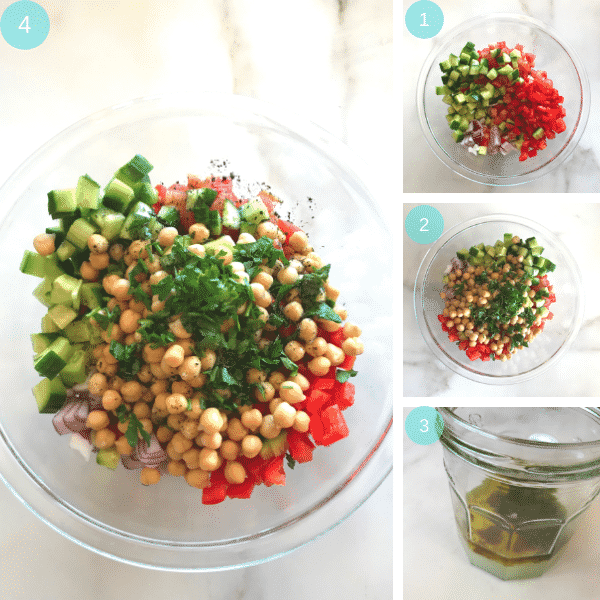 Mediterranean chickpea salad in 10 min. 1 can (15.5 oz) chickpeas. drained and washed. 1 cup red onion diced. 1 1/3 cup cucumber diced. 1 1/2 cup tomato diced. 1 medium red bell pepper diced. 1/2 Tablespoon ground dry mint. 1 teaspoon Salt or to your liking. In a bowl, combine veggies and set aside, (Note1). In an empty jar combine salad dressing ingredients and shake well to combine. Pour dressing over veggies and toss to coat everything well. Let it set for 30 minutes in the fridge before serving. 1) Make a head tip: cut the veggies, cover with plastic wrap and refrigerate for up to 6 to 8 hours. pour dressing over and mix before serving preferably by 30 minutes. 2) For leftovers, drain the salad keeping the water in a separate container. Place veggies in another sealed container. When ready to consume combine the salad with the drained water and enjoy. Made it for dinner last nigh and it was delicious. Leftovers were even better with shredded chicken for lunch today. Syliva, thank you much for trying this recipe… loved the addition of chicken. 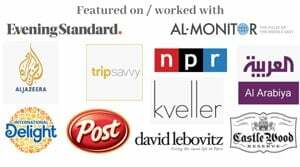 Love your site and your food. You always inspire me Amira. Thanks so much. Oh this comment makes my day Monica, thank you so much.